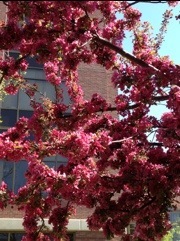 Are the Colors Fall or Spring? country (fall colors). 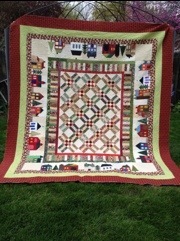 I really like this look in a quilt. It has great style, not just a square or rectangle. The great visual impact is terrific. 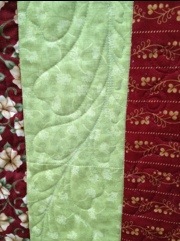 The more I quilted, the more I really liked working on this piece. 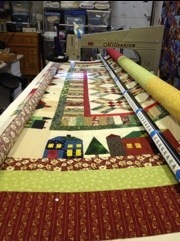 It has a lot of quilting hours on it. 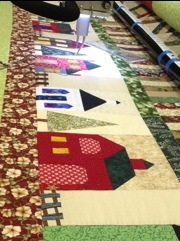 The houses and churches and barns just made me feel great. And then she was done and here is another one I want to keep. Beeeauuuutiful! ! ! 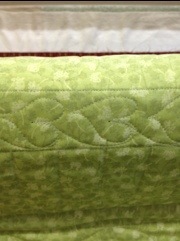 So, why is it that these colors are not fall colors in this quilt? 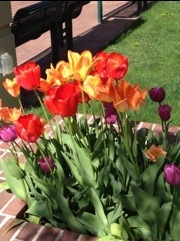 I think I see the colors of these tulips in the quilt. Isn’t it amazing that we use the same colors and get different results because of the style? 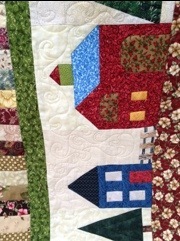 Guess I really am a spring, summer, fall, winter kind of gal when I quilt, just as long as I get to quilt and use those colors. She has gone to her owner. I shall surely miss this one. The good thing is that I am already started on my next one. I think I will keep this one for sure. FLOWERS, FLOWERS, IS IT SPRING YET? Wow, can you believe the color of this beautiful orchid? I was just stunned when I saw it. 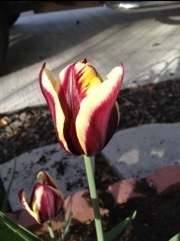 I guess that I am really ready for the flowers that show up in the spring. Then this orchid caught my eye and I am sure that I really like orchids. (That might explain why I seem to buy fabrics with orchid motifs). 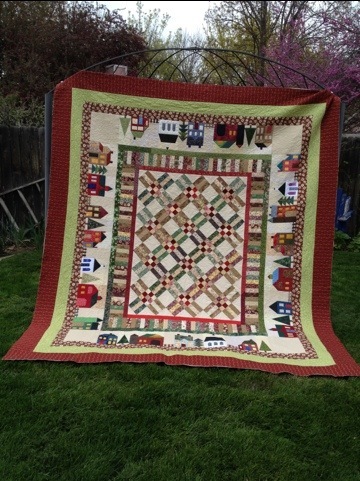 Well, I do not know about you, but I am ready for the gardening season and am still in the midst of all my quilt projects. I am still trying to stick to my goals for this year and as usual, am struggling a bit with having enough time to complete all that I would like to do. 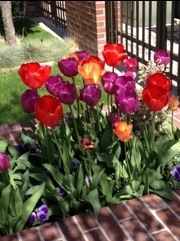 I am also always overbooking my time, so……I decided to take a walk outside to get a breath of fresh air and see just what was blooming in the front. This is one of my favorite for inspiration. They come in such wonderful colors. The bleeding Heart is such a great way to contrast pink, white, and green. I know that I have several fabrics with these colors. I was also looking at those great yellow flowers that always signal the arrival of spring. After my breath of fresh air, I went directly to my local fabric store and of course, I was able to find those great colors for my new projects. I know, I know, I was just saying that I needed more time, but I am sure that I can fit more into my schedule, especially with these Spring Flowers. Think of all the ways these would be great in my next projects. Can’t you just see them here, here or here? I guess I am still in that red and black stage…Can you ever get tired of red and black? This one is like WOW. Think of what is lushious, gorgeous, and down right great fabric! Maybe I should begin planning now so that I can fit this into a project real soon! This windchime in my front yard always reminds me that there is hope. (For me, my garden, and my fabric projects). Keep focused and you too may find hope for your goals.